FUEL EFFICIENT 37 MPG Hwy/28 MPG City! Mazda Certified, CARFAX 1-Owner, GREAT MILES 14,734! Onboard Communications System, Keyless Start, Smart Device Integration, PREFERRED EQUIPMENT PACKAGE, Back-Up Camera, iPod/MP3 Input CLICK NOW! Back-Up Camera, iPod/MP3 Input, Onboard Communications System, Keyless Start, Smart Device Integration MP3 Player, Keyless Entry, Remote Trunk Release, Steering Wheel Controls, Child Safety Locks. PREFERRED EQUIPMENT PACKAGE bright beltline trim, satin silver steering wheel spoke and HVAC control dial trim ring, Automatic On/Off Headlights, Wheels: 16" x 6.5J" Alloy, Advanced Blind Spot Monitoring, rear cross traffic alert, Body-Color Power Folding Heated Exterior Mirrors, turn signals, Rear Seat Armrest w/Cupholders, Rain-Sensing Windshield Wipers, 2-speed and variable-intermittent. 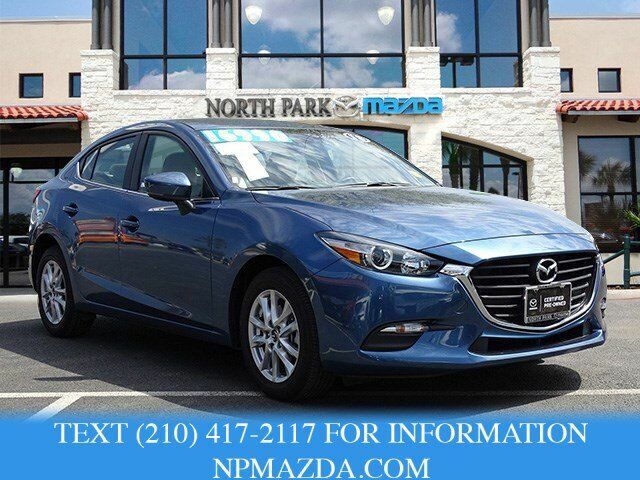 Mazda Mazda3 4-Door Sport with ETERNAL BLUE MICA exterior and SAND interior features a 4 Cylinder Engine with 155 HP at 6000 RPM*. Edmunds.com explains "The steering delivers excellent on-center feel at highway speed, and your inputs feel direct and precise.". Great Gas Mileage: 37 MPG Hwy.